After you’ve purchased your home, you might be excited to start tackling some improvement projects around your house. But, if this is your first time owning, you may not be aware of some of the regular maintenance tasks that will keep your new home in good repair. And skipping out on basic maintenance could cost you thousands of dollars later—for example, caulking a nail on a roof costs $5, where a leaky roof later could cost $5,000 or more. HouseMaster home inspectors can help you manage, track, and get reminders about common maintenance tasks so that your home improvement projects will stay right on schedule. When it comes to scheduling, the tool we recommend most often to our clients is included with their HouseMaster home inspection—HouseMaster Cloud. This online ap has several useful functions, but one of our favorites are the reminders for routine maintenance programmed right in. It takes the guesswork out of knowing when to do which chores and prevents you from skipping over tasks that could turn into costly repairs. Whatever management tool you decide to use, make sure it’s customized to fit your geographic location, age, and specific needs of your home. Speaking of customization, keep in mind that your home and your area will determine the types of home maintenance tasks you’ll need to complete and when. For instance, in the Sioux Falls area, we have harsh winters. So, every fall, you’ll need to remember to winterize your outdoor water pipes to prevent frozen and burst pipes come winter and spring. Also, during cold weather spells, you’ll want to change your furnace filter once a month. Make sure to always have a backup filter so you can change it regularly. This will keep the air in your home clean and keep your furnace running smoothly. 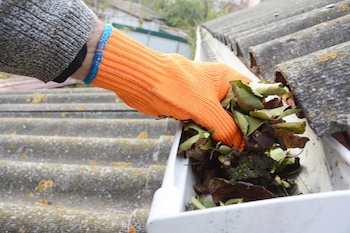 Before winter hits, clean your gutters. Removing the leaves from your gutters ensures water can flow freely through them and away from your foundation. Water can do serious—and expensive—damage. The most important thing for new Sioux Falls homeowners to remember is that scheduling and keeping up on this maintenance now can prevent costly repairs down the road. Your equipment and appliances will last longer, and you can catch big problems early. Let our home inspection experts help you stay ahead of your home maintenance and give us a call today to schedule your home inspection and learn more about HouseMaster Cloud.